Believed to be built in the period of 350 AD to 750AD, Ellora caves came later than Ajanta but hold the same mystical charm that is typical of these caves. The Andakasuramardana incarnation of lord Shiva is special and is a must see for any art lover, as are the other important structures, depicting various dance forms of Shiva. Ellora caves are more important to see the common threads of the three different faiths namely, the Hinduism, the Buddhism, and the Jainism, and more interestingly, to note the integration and tolerance which prevailed at that time. Strangely, even though many invaders tried to destroy and damaged them, they stand with the same charm and antiquity with which they first were built. There are 34 caves, in total, 1st to 12th belongs to the Buddhist faith, 13th to 29th are Hindu caves while the rest are Jain. Though a little difference is seen, which is obvious, the caves are breathtakingly attractive and present a splendid picture of an age where harmony and tolerance were the priorities rather than competition for the highest number of followers. The Ellora caves are in Charanadari hills, in the village Verul, at a distance of 32 kms in the north of Aurangabad and 400 km from Mumbai, between Latitude: 20º1'North and Longitude: 75º10'East. The landscape is cool and soothing, besides the hill caves could serve as the perfect destination for the city dwellers as well as tourists obsessed with crowded localities and polluted environments. The most attractive caves are numbered 2,5,6,10, and 11, however, all the caves are to be visited if one wants to explore the site fully. Cave 2 is interesting for the Verandah and the Sravasti tales depicted on the walls. Cave No 5 consists of a large hall, with porches, aisles, and decorated columns. The central shrine houses a seated Buddha and its entrance is exotically decorated with Bodhisattva adorned with jewelry and headdress. Cave 6 contains some interesting Buddhism figures, among them the Analokiteshwara with lotus, Mahamayuri and other small figures are good pieces of artistic expression in rock sculptures. Vishvakarma, or cave 10 is a Hindu cave and as the name suggests, is dedicated to Vishvakarma, a Hindu God of architecture, engineering and constructions. Amazingly, this Hindu temple consists of figures of Buddha in several poses and positions. There are some female figures too depicted on the walls, with some Bodhisattvas. The cave 11 housed images of Durga, Ganesha, Boddhisattvas, and Buddha in many forms. The addition of images from two religions could be due to the process of promotion of Buddhism within the local Hindu community, or due to the fact that the portion was later dedicated to Hindu gods and goddesses. Cave 11 is somewhat surprisingly called Do Tal (Double Storey). 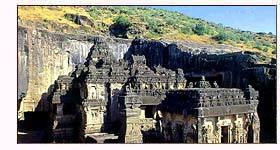 Mural paintings of Ellora are preserved in the Kailasa temple. 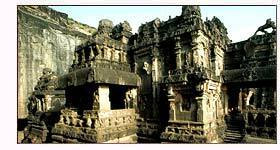 Ellora is also a World Heritage Site. Third week of March sees the extravagant Ellora Festival organized by MTDC. 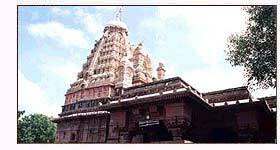 Aurangabad : Named after Moghul ruler Aurangzeb, this city is famous for Humroo shawls, Kimkhwab and Mushroo handicrafts. Biwi Ka Maqbara is a fine Moghul architecture while the Grishneshwara temple is one of the 12 Jyotiralingas in India. Daultabad : Formerly a Hindu bastion, Mohammed Bin Tughlaq renamed. After conquering, it as Daulatabad. This emperor is called the Wise n Fool emperor due to his extraordinary character. Though his warfare techniques, architectural choices etc were superb, he lacked in Management skills. Wooed by the beauty of this hill, he ordered all the citizens of Delhi to be moved to Daulatabad, a foolish decision, causing immense damage to property and huge casualty. Ajanta Caves : The 29 Caves of Ajanta without a visit of which Ellora visit is incomplete, however Ajanta caves are predominantly Buddhist in nature. By Air : Chikalthana airport at Aurangabad (30 kms) is nearest, direct flights fly in from Mumbai, Delhi, Jaipur etc. By Rail : Either, Aurangabad if you have enough leisure time, or Jalgaon, if you need faster trains. By Road : Good road condition, and a superb connectivity from Mumbai.